Doctor Who: The Most Memorable Cliffhangers From The Last Decade | Warped Factor - Words in the Key of Geek. Wil picks his favourite Doctor Who cliffhangers from the last decade. Are we excited for series 9 of Doctor Who? Of course we are! Oh, Grand Moff Tarkin, you are a tease! There was a point in time, when Doctor Who thrived on 4 and 6 part stories, that the cliffhanger was an essential ingredient for every story, but since the show returned to our screen in 2005 we've been lucky to get one or two a year. To start with an episode that is not Dark Water, I said reverse chronological and I meant it. The Twelfth Doctor has only had the one cliffhanger to date but in all honesty was the "Missy is the Master" reveal really a surprise for anyone? It was a great double episode, for sure, but the cliffhanger left me mainly feeling "well of course she is, d'uh! ", unlike the closing episode of series 7. A cliffhanger that was a complete and utter game changer. We knew John Hurt would be in The Day of the Doctor, but we had no idea he'd show up in the closing minutes of The Name of the Doctor. Even the review copies were missing the last few minutes, but there, in the Doctor's time stream, was the one he never talks about. If you needed an extra reason to watch the 50th Anniversary special, which of course no-one did as it was shaping up to be all kinds of awesome anyway, here was the mother of them all thanks to Steven 'Tin Tin' Moffy. And then the resolve for this cliffhanger came in the form of the ultimate Brucey Bonus - The Night of the Doctor, with Paul McGann, answered all the questions on the who? what? why? 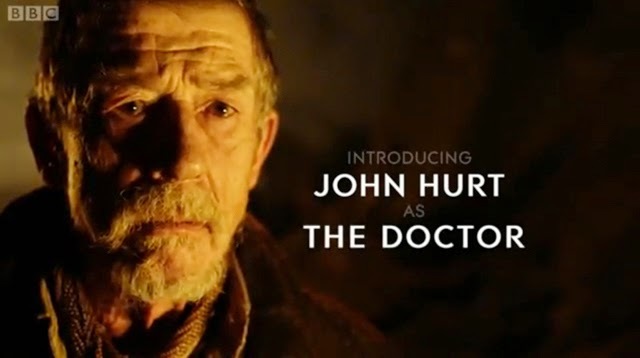 of John Hurt's War Doctor. It was like all my birthday's coming at once. A cliffhanger after cliffhanger of an ending. I honestly thought the episode was done on about three occasions, but they kept layering more. 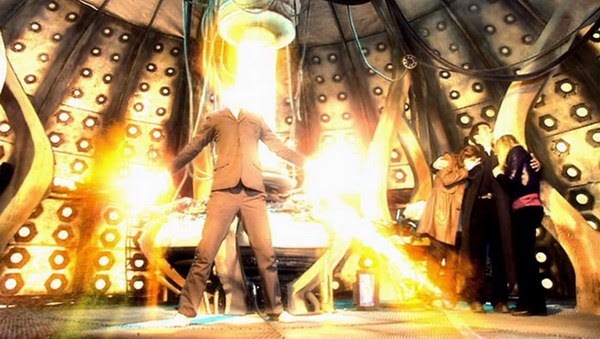 We have Auton Rory shooting Amy and her dying on screen, cue music sting..... nope not yet as the Doctor has to be locked up inside the Pandorica by his enemies, as he pleads for release surely it's time to cue musi..... wait. River seemingly causes the end of the universe, as you do! Blackness, silence, and scene. But, but, but you can't David Tennant, say it isn't so? Our time together is not done yet, and, and, and.... I literally couldn't breathe with anticipation for the next episode. And it was only bloody titled Journey's End! For my money, this is by far and away the best cliffhanger new-Who has delivered. Yes, the payoff was rubbish, but those few seconds were amazing. An absolute jaw-dropper. Another unexpected regeneration, and a cliffhanger that went on for about ten minutes. 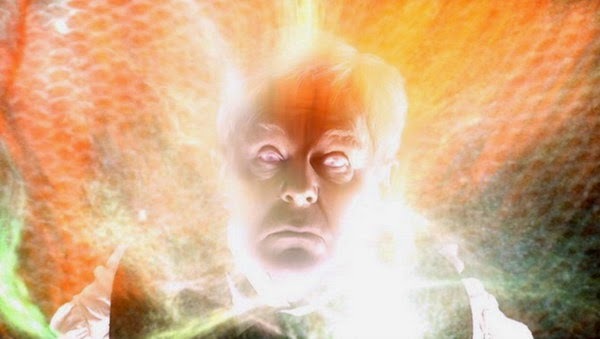 Utopia pulled on loads of elements from earlier in the season, and although we'd heard rumblings of a return for the Master in season 3s finale, I didn't twig until the last act that Derek Jacobi was one and the same. Just discovering that alone would've been cliffhanger material enough alone, but it just keeps accumulating. Professor Yana is shot by his assistant and regenerates into John Simm, who inturn hijacks the TARDIS, taunts the Doctor, getting his to say his name, and then leaves David Tennant and co stranded at the end of the universe. I was on the edge of my seat throughout the whole last ten minutes. It's bonkers really, but brilliant bonkers, and puts Utopia in my all time Who top 10 episodes. Army of Ghosts had a great cliffhanger. It was the kind that made you literally ache to see the next episode! You see, we'd had the Dalek finale the year earlier, and this season it was the turn of the Cybermen - or so we were led to believe. But that mysterious extra-dimensional void-ship turned out not to be of Cyber-technology. Oh no! As the sphere opened out came some Daleks who had survived the Time War. All week long I had palpitations at the thought of Daleks vs Cybermen. Both of Who's heavy hitters in one episode was nearly too much for one nerd to take. Although the resolve was pretty good, with Daleks and Cybermen taunting each other, and Doomsday itself is a great episode, it couldn't match up to the anticipation this cliffhanger had me feeling. But that's OK, it was just doing it's job. And it did it very, very well. Not the strongest of episodes this one, but boy what a finish. Bad Wolf closed with the Ninth Doctor's finest moment. It's not a huge "No", it's not a screaming "No", just a simple but firm "No". And you know he means business. DOCTOR: Because this is what I'm going to do. I'm going to rescue her. I'm going to save Rose Tyler from the middle of the Dalek fleet, and then I'm going to save the Earth, and then, just to finish off, I'm going to wipe every last stinking Dalek out of the sky! 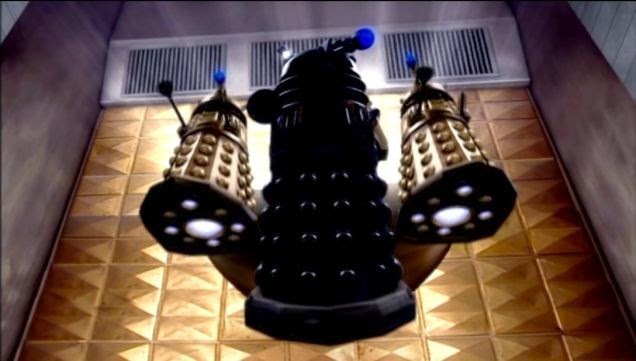 DALEK: But you have no weapons, no defences, no plan. DOCTOR: Yeah. And doesn't that scare you to death. Rose? DOCTOR [on viewscreen]: I'm coming to get you. It was punch the air territory. It was time to shout "Come on!" and pull your arm back like that little kid in the meme. 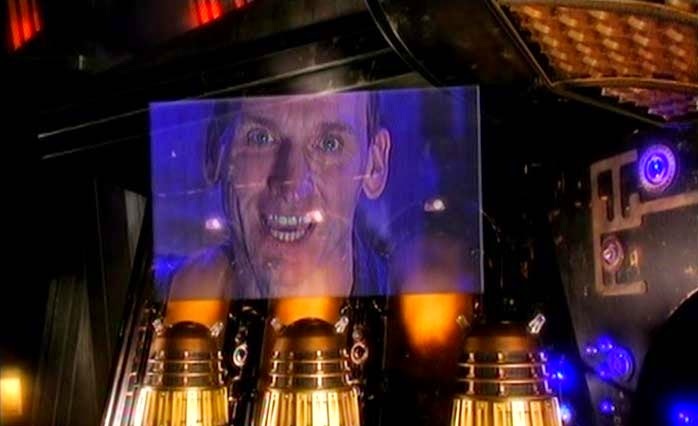 It was the memorable cliffhanger the Ninth Doctor needed, and it still remains one of the greatest moments in New-Who that we've seen. Well that's my memorable cliffhangers from the last decade, let's hope that by then end of the year Peter Capaldi will have one or two to add to this list. In the meantime which cliffhangers are the most memorable for you?